If Thomas Magnum ever got fed up with being the best private detective Oahu had to offer and went racing instead, you know he’d have gone for a 308 GTB rally car despite anything Higgins had to say to the contrary. 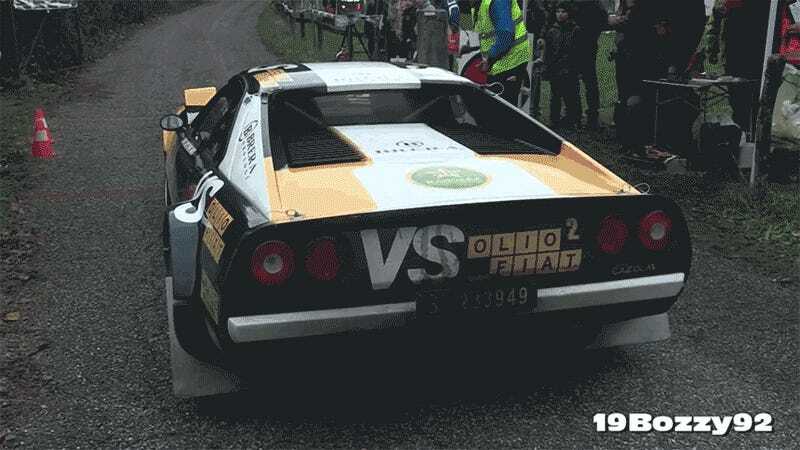 In many ways, the Ferrari 308 is similar to the Lancia Stratos, one of the most successful and striking rally cars ever made. But while Lancia was rocking it at all levels, the 308 Group B was more of a privateer affair with only four cars officially getting the upgrades from Group 4 specification by Michelotto, a Padova-based Ferrari dealer. According to auctioneers William I’Anson, one of these four featured the older 2-valve engine tuned to 288 horsepower, while the following three had the Quattrovavole and Bosch K-Jetronic injection, good for 8,000 rpm and 310 HP. Luckily, a few brilliant teams built replicas since, realizing that the the world needed more gravel-capable V8 Ferrari race cars out there. Naturally, you can do the same with the extremely versatile Lamborghini Gallardo in case the 308 GTB is too old fashioned for your taste, but be aware that the Robin 1 plate only looks good on a Ferrari with the Olio Fiat livery. You can smoke a chorizo with that.